Happy New Year! I’m surprised to say that I’ve made it on my blog past New Year’s Eve, so maybe this whole New Year’s resolution of writing more is working out. Then again, it’s only the first day of the year, so I shouldn’t speak too soon. Anyway, as those of you who have been following my blog might already know, I am a huge advocate of traveling. I love trying new foods, meeting new people, and learning about other culture, so whenever I get the chance to go somewhere, I’ll always try writing about my experiences. This past summer I was fortunate enough to have traveled to Poland, Hungary, Slovakia, and Austria, so over the next few weeks, I’ll be documenting my trip, so feel free to read along about my experiences in each country. My mother, sister, and I flew on a Thursday morning in mid-August from Miami to Amsterdam and then from Amsterdam to Poland. Unfortunately, we weren’t able to leave the airport in Amsterdam or spend any time there, but who knows what the future has in store? We landed in Warsaw, and took a shuttle to the hotel which was around forty-five minutes away. When we arrived to the hotel, it was dinner time, and after that, we went to sleep because our organized tour would begin early the following morning. The following day, Saturday, happened to be Polish Army Day, which is a national holiday. This didn’t affect our plans, and if anything, it was perfect timing since it made traveling on the roads to each destination much quicker. We essentially drove throughout the city, and at each major tourist attraction, we would get off the bus with our tour guide, as he explained the significance of the monuments before us. 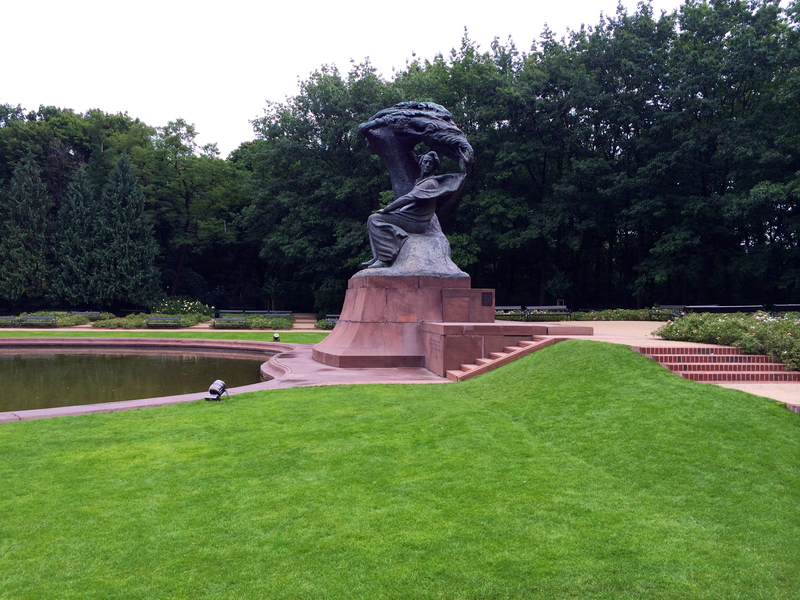 Warsaw takes pride in the fact that Frédéric Chopin, a Polish composer and virtuoso pianist during the Romantic era was born there in 1810. So it was no surprise that the city built a statue in 1926 to commemorate his life and work, but the statue was destroyed during the Second World War. It was later rebuilt in 1956. We then went to Umschlagplatz, which roughly translates to “collecting point.” In the beginning of 1941, many Jews from surrounding communities, west of Warsaw were sent to the Warsaw Ghetto, and in 1942, Jews from surrounding towns to the east of Warsaw were sent there as well. “At its height, the total population of the Warsaw ghetto exceeded 400,000 people. Miserable conditions in the ghetto, deliberately exacerbated by German policies, worsened over time. In 1941, one year before mass deportations, over 43,000 people died, more than 10 percent of the entire ghetto population” (http://www.ushmm.org). Between July and September 1942, nearly 300,000 Jews were deported from the Warsaw ghetto to the Treblinka II extermination camp. Jews were forced to march to the Umschlagplatz (concentration point), and from there, they were to board freight cars bound for Malkinia, where they were then diverted along a special rail spur built by the Germans to Treblinka (a small town, northeast of Warsaw). 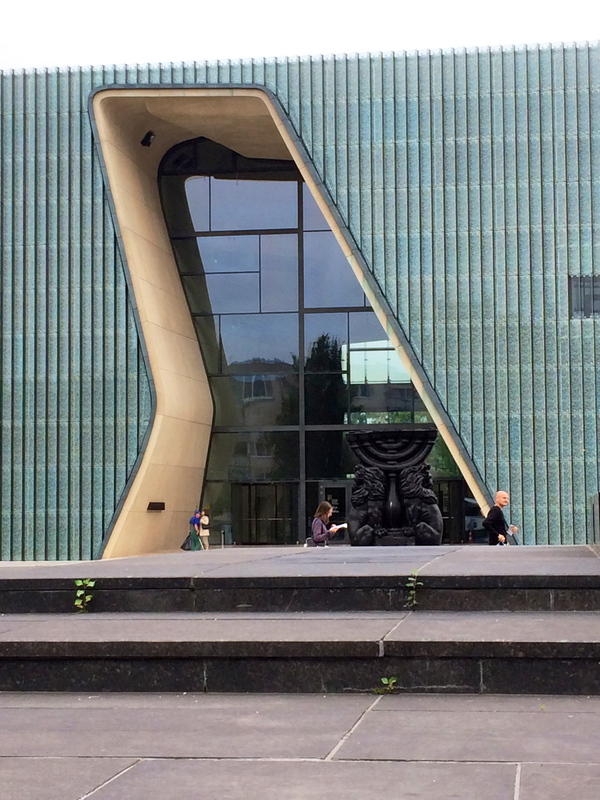 After passing the site of Umschlagplatz, we went to POLIN Museum of the History of Polish Jews. Outside the museum, there is a two-sided monument. On one side, you can see the Jewish people on their way to Umschlagplatz. 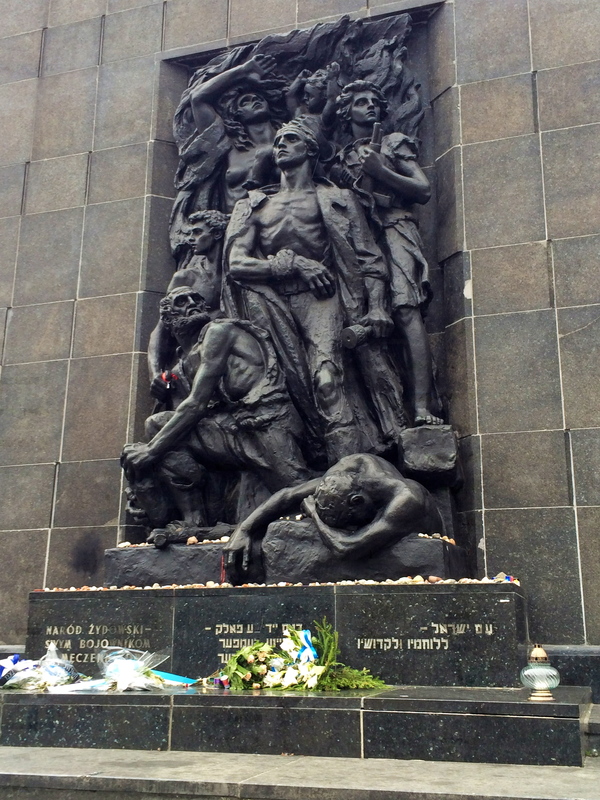 The other side is dedicated to the heroes of the war and commemorates those who took part in the Warsaw Ghetto Uprising. “On April 19, 1943, the Warsaw ghetto uprising began after German troops and police entered the ghetto to deport its surviving inhabitants. Seven hundred and fifty fighters fought the heavily armed and well-trained Germans. The ghetto fighters were able to hold out for nearly a month, but on May 16, 1943, the revolt ended. The Germans had slowly crushed the resistance. Of the more than 56,000 Jews captured, about 7,000 were shot, and the remainder were deported to camps” (http://www.ushmm.org). The last notable statue that we saw was of Nike, the goddess of victory. 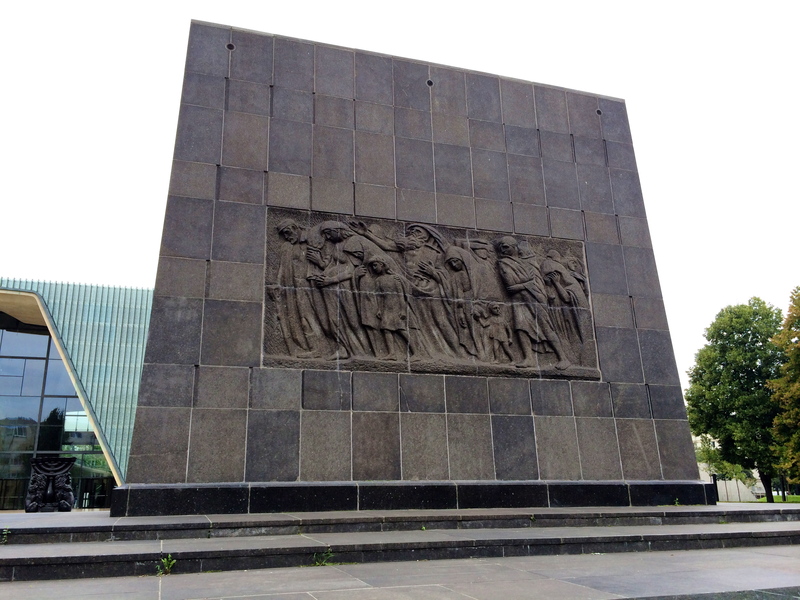 This monument was erected in honor of the heroes of Warsaw who fought for their home, and symbolized the rebuilding of the country as a whole. The statue represented a sign of positivity and really showed the strength that the city of Warsaw had to rebuild itself after such a difficult time in history.